There are days when you get up in the morning and you know that you're going to have an amazing day. Today was one of those days. 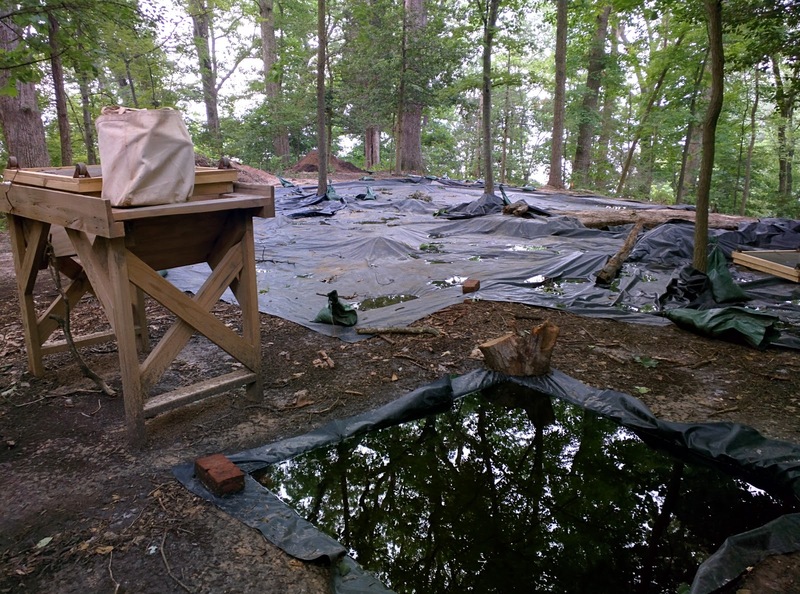 Today I had the chance to work with the Mount Vernon archaeologists at an active site on the grounds. Other than participating in a practice dig a couple of years ago as a Project Archaeology participant at Fort Osage along the Missouri River, I have no technical experience. 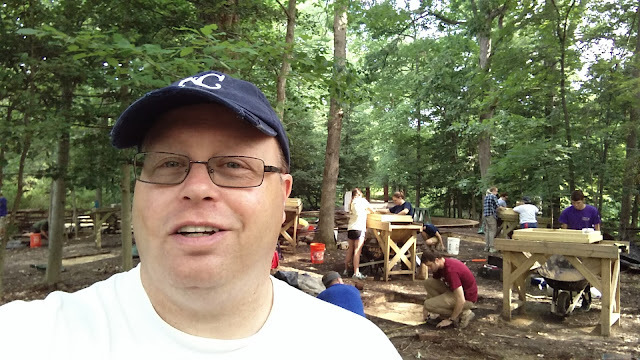 The project I am working on during my Mount Vernon Life Guard Teacher Fellowship is creating a lesson plan that middle school teachers can use combining the fundamentals of archaeology and archaeology which has occurred at the Mount Vernon estate. So today was a big day, one that I have been waiting for since receiving news that I was award the fellowship. I reported for duty at the Mount Vernon Archaeology Office at 8 AM. I checked in with Joe Downer, an archaeologist at Mount Vernon who is the crew chief of the Slave Cemetery Survey. I signed some paperwork as a volunteer and waited as other volunteers arrived. On Fridays and Saturdays anyone over the age of 16 can volunteer to work at the site. As the volunteers gathered this morning it was clear many of them were people that volunteer on a regular basis. It was a mix of college students and retirees who have an interest in archaeology. Some students are working to gain experience and others are pursuing other degrees but feel drawn to the experience the archaeology provides. We walked to an active archaeology site near the mansion to pick up some tools and wheelbarrows. Then we headed to where we would be working - the Slave Cemetery on the Mount Vernon Estate. The slave cemetery is located just down the hill from Washington's tomb. I had been researching a little about the site online and had watched several videos that Mount Vernon has produced on the progress. The general purpose of the survey is to determine how many people are buried in the cemetery. There is an eye witness account from 1833 describing the cemetery and there was a ground penetrating radar survey conducting in 1985. Both of these accounts provide some potential insight to the number of people buried at the cemetery but there has never been an archaeological survey to confirm the number of individuals resting here. Upon arriving at the site our first task was to remove the tarps covering the active dig locations. It had rained quite a bit lately and the parts of the site looked like a swimming pool. We bailed out the water and removed the tarps on the areas at which we would be working today. Joe assigned groups of volunteers to specific areas with specific tasks. I was grouped with two volunteers with experience at the site - Devin, a college student and Dave, a retiree. One of the things that impressed me the most about the experience was that everyone was so helpful. I asked a lot of questions, took many pictures and recorded some video. Throughout the day everyone was helpful in explaining the procedures and reasons why they were doing certain things as they worked at the site. Our first task was using a trowel to work down a particular grid to the same level as the grid adjacent to it. The three of us used the trowels and collected the dirt in buckets which would be dry screened to check for any important material which would need to be saved. Many think that finding "stuff" is the reason for archaeology but in this case there typically isn't a lot of material to be found. The primary purpose is to locate the graves and this is accomplished by reaching a level in the soil which clearly shows a different color of soil, thus illustrating where the burial staff is located in the ground. When the ground is dug to create a burial site and then soil from deeper in the ground is then placed on top of the burial cavity it creates a very visible difference. The survey is not disturbing any of the actual burial sites, just identifying where they are located. The possible material from the soil we are removing could be from Native American activity potentially thousands of years ago. The site is a wooded area on a hill overlooking the Potomac. The work already done on the site has yielded a wealth of evidence that Native Americans used this site to work on creating stone tools. Complete projectile points aren't as common as the flakes and remnants but they are being found at the site. Today several points which looked nearly complete where found. After our group worked the grid we started on down to a level consistent with the others around it Joe told us to start work on the grid just up the hill from our current one. Prior to starting work on removing the topsoil we examined the map showing the results of the ground penetrating radar survey in 1985. It showed what would appear to be a burial shaft in the lower corner of the new grid. After recording the elevation of new grid and writing new id bags for the artifacts we started removing and screening the topsoil. We were able to work down the topsoil but by the end of the day were not able to identify any specific burials in the grid yet. It was an amazing day for me. The site at which we were working is beautiful and everyone was helpful and took the time to explain the procedures behind what we were doing in terms of cataloging and identification. I learned a lot about procedure that I think I can incorporate in my archaeology lesson plan. Thanks so much to Joe and all of the volunteers who made it a very memorable day at Mount Vernon.